It all started with a fridge and a handful of worms. Ivan Berry and his wife Marilyn proved to all that know them, that with a little sweat and perseverance, you can accomplish your dream. In the spring of 1972, Ivan and Marilyn began Berry’s Bait & Tackle, by selling dew worms from their basement. Marilyn recalls donning rubber gloves and flashlights and heading into the night out on their property, located in the heart of Richmond’s farming community, to harvest dew worms. “There’s nothing to it – see a worm, pick it up.” Their children, Mike and Michele, would often tag along to help Mom collect worms. “We had a fridge out on the driveway, with a jar for fishermen to leave their payment – it was an honor system” said Marilyn. “Then, guys started asking if we had any weights or hooks for sale, so we started carrying a small supply of tackle. Before we knew it, our little business had to move from our basement into the garage! Eventually, the Berry’s perfected how to make a variety of roe bait in addition to packing worms. Soon they were supplying many service stations with all of their bait products. Meanwhile, the store continued to grow. Mike began working in the store, then Len Marshall, who would eventually become a partner in this growing family business. (Many of Berry’s regular customers actually mistake Mike and Len for brothers!) Finally, Michele joined the team to make it a true family business. Ivan and the senior staff make their annual pilgrimage to Rivers Inlet, BC each August in search “Walter”, the mythical spring salmon which run through Rivers Inlet. Base camp is Salmon King Lodge, now returned to it's original name Good Hope Cannery Lodge. Ivan and Marilyn were part owners of this lodge, and Ivan helped transform it into one of the foremost fishing resort lodges in the Province. Mike and Len make their annual trek to the mighty Thompson River each November in search of the ultimate trophy – Steelhead. They are always more than happy to share their wild tales of triumph and champion with our customers. Ivan Berry 72lb. Chinook, and many 60+lb. Ivan won the Daiwa/Safeway fishing championship with a 65lb. Chinook in 199?? Marilyn Berry 55lb. Chinook. Marilyn prefers to catch the record size Coho that are found in Rivers Inlet. Mike Berry 65lb. Chinook, caught in 1996, which won Mike the Daiwa Safeway championship. Michele Berry 67lb. Chinook in 1994, 63lb. Chinook in 1995, and a 56lb. Chinook in 2001. Len Marshall 58 lb. Chinook in 199?, and many 50+ lb. Chinook. The Berry’s understand that what their customers expect is service, selection, knowledgeable staff and good prices. People often come in to the shop with their tackle boxes already brimming, seeking advice from Berry’s expert staff. Many times a budding fisherman is sent off to the fishin’ hole with just the items he already had in his box, and with a clear idea of how to use them to make that prized catch. Berry’s Bait & Tackle has built a reputation on top-notch customer service first and foremost. We won’t try to sell you something just to make a sale! Our staff are expert fishers themselves who are committed to promoting the enjoyment of fishing to everyone. Berry’s customers can be confident with the advice they are given, from choosing the right tackle, to pointing them in the right direction for fishing success. This honesty and quality service is what has kept people coming back for over 45 years. In addition to great service, our customers eagerly anticipate Berry’s two annual sales events: one in mid-April and the other during Father’s Day week. Berry’s also provides their own free recorded fishing report at 604-638-5899, and our website featuring e-commerce, fishing information, and fishing report! Berry’s Bait & Tackle has grown to become the best stocked sport fishing tackle store in British Columbia. Located on the site of the original garage, the store now boasts a huge inventory of nearly every kind of tackle and bait imaginable. 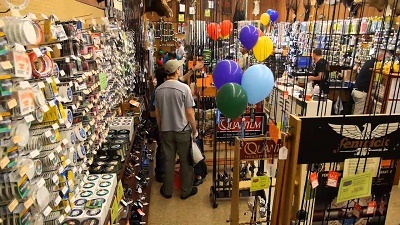 Ask anyone who fishes, and they will most likely have heard of Berry’s Bait & Tackle, and likely they will have shopped there – whether it was for their first Snoopy tackle box or their latest Sage rod, all have become the valued customers to whom Berry’s strives to serve. Looking toward the future, as the business continues to expand and grow, Berry’s is busy building on its existing customer base in British Columbia, and with their new website, globally.